There are some superb Salento treks in El Valle de Cocora (the Cocora Valley), one of the few regions left where the majestic Wax Palms (palmas de cera) grow. They have the distinction of being the world's tallest palm trees and, like giant spears, pierce the slopes of the valley. For this reason, I strongly recommend not going alone unless you're just planning on strolling around the lower valley. To begin any kind of trekking you first need to get from Salento down into the valley. The best way to do this is to catch a ride on a jeep, known locally as a 'Willy'. The 'Willies' leave en masse from the main plaza every couple of hours, starting at 7:30am. Try to get a jeep at this time if you can, as the jeeps and trails get busier later on. The trip down into the valley takes 25-30 minutes and costs about 3,000 pesos. The jeeps drop you at a trout farm where there are also several shops and restaurants. The jeeps begin returning from the valley to Salento at around 2:30pm. It's best to check times with them when you head down in the morning. Rain is frequent in this region, and the trail can get extremely muddy, so it's a good idea to bring wellies (these can be hired in the town) or boots. It's here in the valley that you'll be treated to some great views of the famous wax palms trees. After a couple of hours trekking up into the cloud forest, you'll see a fork in the path. You can either go straight ahead to 'Reserva Natural Acaine' or turn left to 'Finca de la Montaña'. At the Acaine Natural Reserve you can see colourful hummingbirds fluttering around. It costs a couple of thousand pesos to enter (about a dollar). For a bit extra you can enjoy cheese and hot chocolate (drank out of a bowl) - very common in rural parts of Colombia. I'm not a fan of the salty cheese they usually serve up, but the hot chocolate is amazing! From Acaine Reserve you can either head back down into the valley in the direction you came or, a better option if you have time, is to wander back to the fork and turn off for Finca de la Montaña. The path up to the finca (farm house) is very steep. It makes for a tiring 45 minutes or so, but isn't technical﻿ly challenging. At the finca you'll be able to take a break, get some refreshments and enjoy the views. To complete the loop you continue on the path which winds all the way down to the valley. 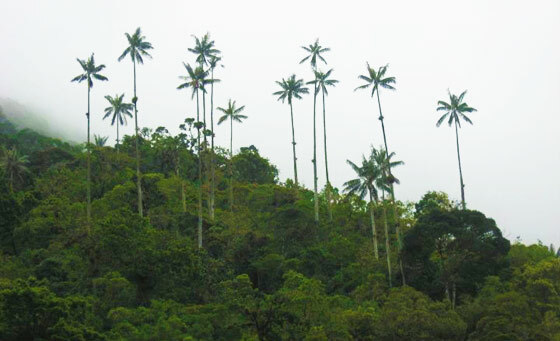 The palmas de cera (wax palm trees) cover the Cocora Valley and are visible on all Salento treks. They are the tallest palms in the world and can grow to an impressive 70m! By the time you're back where you started, you shouldn't have long to wait for a jeep to take you back into Salento. As well as the standard Salento treks, It is possible to do hikes that last several days. If you are able to do this, you'll be treated to some phenomenal landscapes. Continuing on up and out of the cloud forest zone brings you to a wild area known as Paramo de Romerales at an altitude of 3,500m. Here you can find two lakes; 'La Virgen' and 'El Encanto'. The paramo is actually part of Los Nevados National Park - its main attraction, the majestic snow-capped volcano Nevado del Ruiz, is some 20 miles to the north. 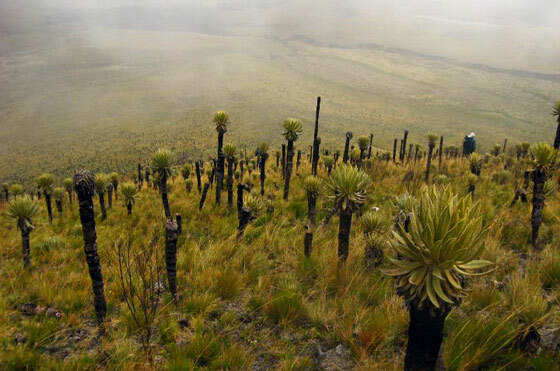 The paramo is a barren, wind swept place and is dominated by frailejones, stumpy shrubs typical of this environment. 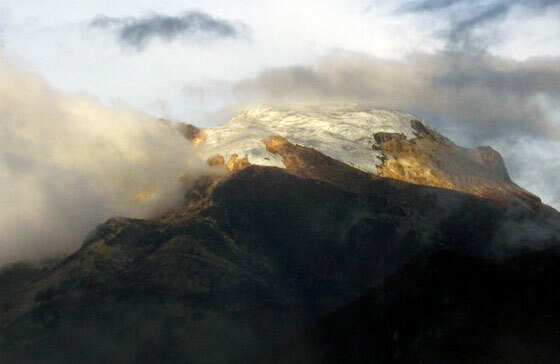 Trekking to the top of Cerro La Virgen (La Virgen Hill) at 3,800m provides some amazing views, including that of the imposing snow-capped volcano 'Nevado del Tolima' that climbs to 5,200m. Seeing the stupendous volcano with glaciers clinging to its steep slopes is a great reward after a long hike! Warning: This trek should preferably be done with a knowledgeable guide, or at the very least in a small group as weather conditions can change fast and it's easy to get lost if you're not careful. Don't go alone! When walking in the countryside, I've often found myself having plot my own route, often ending up faced with a dead end or a farmer's barbed wire fence. And I'm not talking about the Amazon jungle here - much of the picturesque countryside surrounding towns and villages have no set paths to follow. And where there are paths, they are rarely sign-posted, and little information about them seems to exist. 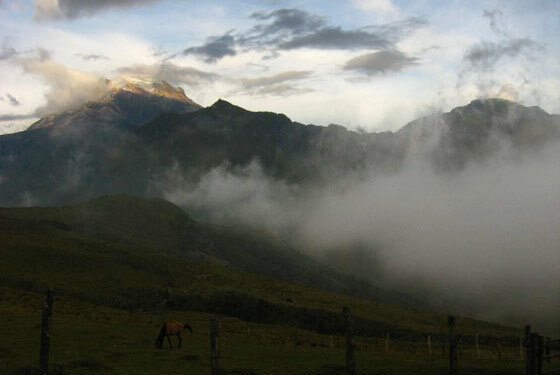 As a result, trekking is not a pasttime that many Colombians take up. When I mention to my Colombian friends that I spent the weekend wandering the countryside by myself, they look at me as if I'm mad! In recent years I've noticed an increase in trekking clubs and organisations, but it is still very much a niche activity. See my main guide to Salento for more information on the town itself including hotel / hostel recommendations and coffee tours.